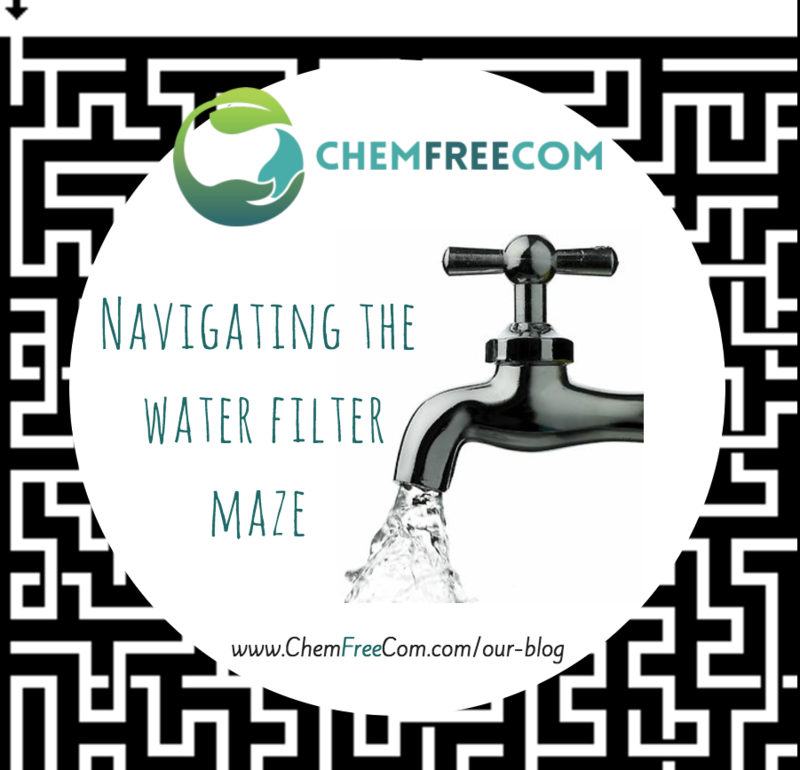 If you are travelling down the road of reducing the toxins in your life then you will be at some point navigating the water filter maze. We are asked, ‘what’s the best water filter to get’, at nearly every event and workshop we run. It’s not an easy one to answer. So I refer to our ambassador Nicole Bijlsma from the Australian College of Environmental Studies for her advice. Does your water look or taste strange or have a blue colour to it? Is it brown or yellow? There are many chemicals added to our water to make it safe to drink. 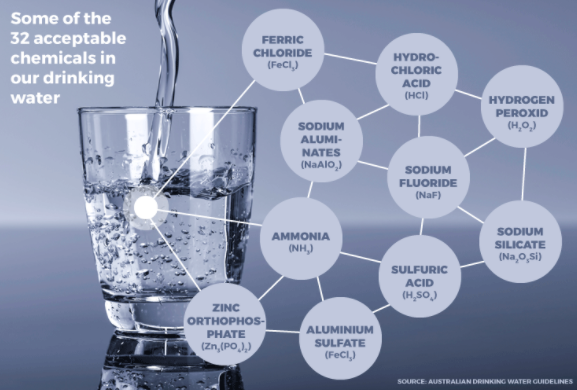 According to the Australian Drinking Water Guidelines, there are 32 different chemicals approved for Australian water treatment plants to add to water. What’s in your water will depend on where it comes from, bottled, tank or tap water. Each will have different contaminants. Some of the nasty chemicals in our tap water and their potential impact. Chlorine – There are a number of health concerns associated with the use of chlorine in the water supply. Firstly it acidifies the water (lowers pH) thereby increasing the leaching of heavy metals such as copper and lead. It kills bacteria in your gut which plays an important role in the health of your digestive and immune system. Lastly, it combines with organic matter (such as leaf litter in the rivers) to creates cancer causing trihalomethanes. This is why most European countries DO NOT chlorinate their water supply. Fluoride – 97% of countries around the world DO NOT fluoridate their water supply for two reasons: it is unethical to mass medicate an entire population with a drug that cannot be monitored by a doctor and secondly, it causes health problems such as dental fluorosis, an increased risk of osteoporosis and hip fractures (fluoride displaces calcium in the bone and makes it more brittle) and osteosarcoma (bone cancer). Its ability to reduce tooth decay is unfounded given that there were similar declines in tooth decay in every western country most of whom did not fluoridate their water supplies. A list of tooth decay trends in fluoridated versus unfluoridated countries is available at www.fluoridealert.org. Aluminium – there are unexplained links between human exposure to aluminium and the incidence, progression and aetiology of Alzheimer’s disease (Exley et al, 2006) especially in light of the fact that elevated concentrations of aluminium have been found in the autopsied brains of people who suffered from this disease (Perl and Brody, 1980). If your hot water is derived from a hot water tank, an aluminium anode rod will most likely be used to prolong the life of the tank. Aluminium ions may be present in your hot water which is why you should never DRINK or COOK with hot water from the tap. These levels are not regulated by any authority. Lead – may arise from lead solder on metal pipe, brass taps, lead pipe (used prior to 1930), and PVC pipe. Lead poses a major risk to children’s physical and mental health with extensive research associating it with a reduced IQ, impaired hearing, anti-social behaviour, learning and behavioural disorders such as Attention Deficit Hyperactivity Disorder, as well as increased aggressive behaviour and criminal tendencies to name only a few! (The Lead Group, 2010). Lead contamination in household drinking water is likely to be grossly underestimated in Australia. Copper – if your water comes out a bluey-green colour for the first few seconds, that’s a sure sign you have copper pipes. Another sign is a green/blue stain around the bath tub ring. Copper in low doses may cause fatigue, irritability, headache, as well as muscle twitches and joint pains and in high levels may cause stomach cramps, nausea, vomiting and diarrhoea, as well as liver and kidney damage (Agency for Toxic Substances and Disease Registry, 2004). Pesticides – despite the fact that there are thousands of pesticides currently registered for use in Australia, very few of these are tested in our waterways on a regular basis. Which type of water filter is best? How much money you are willing to spend. 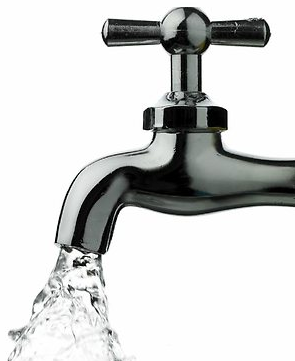 What contaminants you wish to remove which will largely depend on your source of drinking water: tap, tank or bore/well. The ideal filtration system for each of these sources is discussed in my book Healthy Home, Healthy Family. Whether you want a portable system (if you are renting or have a budget) versus a plumbed-in system. How much bench space you have. Your water pressure; the more units incorporated into your water filtration system, the more pressure you will require. Whether you want a point of use (POU) system ie one that is located at the kitchen tap or shower OR a point of entry (POE) system. Whole house systems are installed at your water meter and filter all the water coming into your home. Be mindful however that apart from their expense, these systems will NOT remove contaminants like rust, lead and copper arising from your domestic plumbing which is why I rarely recommend them. Water Filters for home use. Sediment filters are designed to remove particles such as dirt, rust, sand and clay and to protect carbon filters from clogging up too quickly. They can be made from a variety of different materials including polypropylene, polyester, cotton, cellulose, ceramic, wound string and glass fibre and come in a variety of micron sizes – 1, 5 and 10 microns. The smaller the size, the more effective they are at trapping smaller particles. Carbon filters are sourced from organic matter such as wood, coal, bamboo, or coconut which are exposed to high temperatures in an oxygen deprived environment. They are then “activated” to increase their ability to adsorb contaminants by heating them with oxidising gas or other chemicals to break them into a fine powder. Apart from improving the taste, colour and odour of the water, carbon filters will effectively remove sediment, pesticides, petrochemicals, chlorine and its carcinogenic by-products (trihalomethanes). However they will only partially remove fluoride and heavy metals such as copper and lead. Their efficiency at removing contaminants will vary depending upon their micro n size (0.5, 1, 5 and 10 microns), how effectively they are activated, and what they are derived from. In addition, their effectiveness declines rapidly with use as the absorption sites get used. If you wish to remove heavy metals, use a carbon filter impregnated with KDF. These filters need to be replaced before the manufacturer’s use-by-date as the effective life of a carbon filter is difficult to establish and bacteria will grow on the filter media. Ceramic filters are cheap, long lasting and portable filters that effectively remove bacteria, chlorine, sediment and rust. However ceramic filters are not effective in removing heavy metals or pesticides, require regular maintenance (scrubbing to remove the biofilm), are slow to filter and can quickly clog up. Most ceramic filters consequently come with a carbon cartridge to remove organic contaminants such as pesticides and petrochemicals. Ion exchange resin filters are used to remove heavy metals, fluoride and nitrates and to soften hard water. Whilst a variety of resins have been used including aluminosilicates, heavy metals, and synthetic resins like acrylic, the most widely used resin is styrene-DVB (divinylbenzene) gel polymer. However they do not remove sediment, pesticides, microbes or chlorine. Furthermore, bacteria may grow on the resins and they may leak tiny resin fragments into the water supply which is why I don’t recommend them. UV sterilisers are commonly used in aquariums and to sterilise medical equipment because they kill bacteria, algae and parasites and reduce cysts. They are not commonly used for water filtration in homes that rely on tap water as chlorinated water will effectively kill bacteria in the distribution system. However, they should be considered as an additional add-on to a reverse osmosis system if you are ingesting tank water. Reverse osmosis filters are a multi-stage system incorporating various sediment and carbon filters as well as a semi-permeable membrane. This system will effectively remove fluoride, pesticides, petrochemicals, chlorine and its by-products, asbestos, nitrates, radium and heavy metals (lead, copper, cadmium, chromium aluminium…). However they are expensive to buy, install and maintain, they will need to be plumbed in and they expend a considerable amount of waste water which will need to be diverted. Furthermore, they require considerable under sink bench space. 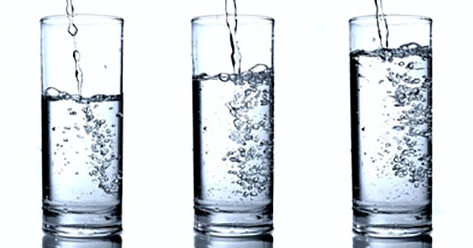 There is a concern that reverse osmosis water is ‘dead and acidic’ water. However, most water found in lakes and rivers is slightly acidic (it absorbs carbon dioxide in the air to form carboxylic acid). As for the absence of minerals, my argument is that you shouldn’t be relying on water for this anyway. In response, many people alkalise their RO water which I do not recommend. Now you are armed with the right questions to ask yourself and an understanding of what is out there in the market it’s time to look at your options. Search the Chemical Free Community directory for online and physical retailers of water filters. Select ‘Water Filters’ from the product category list. If you currently have concerns that your home may be contributing to your ill health or you want to optimise your internal environments (home or office) so they support, nourish and promote wellbeing and a chat to our team of advisors, Narelle McDonald and Lucinda Curran from Australasian Society of Building Biologists.